Looking at a second-hand 991.2 GT3 to scratch my GT itch once and for all. Although a good spec, can't help but feel that there are 3 or 4 things missing from this list that are nice-to-haves, but yet would make the car more complete. Are there any options that you would personally want coupled with the above ? In terms of colour, my head says guards red, but my heart says racing yellow. Any opinions ? Get it bought and report back asap. Nice spec, as you say most if not all of the ‘must have’ options. I personally would want the ceramic brakes and BOSE, I’m sure others would argue against that however. I don’t think you will be disappointed if you get one. Again, it’s only my opinion but as good as they are I wouldn’t use it through the winter for several reasons. I can’t see the current stock levels reducing much at all over the next 6 months so would look to buy either late this year or early next and bargain hard. You are the third person to say that to me in the space of a day. Any preference on guards red or speed yellow ? I don’t really buy bright cars, but I’d probably settle on Guards if push came to shove. Yellow with some black and a Transformers sticky might do though. Red. Yellow attracts flies, as does ceramic sealant, something I discovered yesterday! Guards is always a winner, yellow is tasty but may possibly narrow down the buyers field when the scratch has been itched. Only my 2p, not fact. It looks a pretty good spec to me. The only option that I might want is BOSE but TBF you probably wouldn’t notice the improved audio over the engine/tyre noise. Its a good spec, Ceramic Brakes ? but the OEM brakes are good enough and yellow calipers wont match the car. Thank you all for your opinions and guidance. Went for a yellow car in the end. The red car had been round the Nordschleife and had the patina of a car driven at sustained high speed. The yellow car is March 2018 with 1K miles. Not a mark on it. Similar spec to the red car but marginally better in a few areas, 7 months younger and 5K less miles. Excellent trade-in price for my C4S which is now 52 months old/20K miles, and a good deal on the GT3. Am absolutely delighted at the new car and the service from Belfast OPC - intend to pick up this Friday. 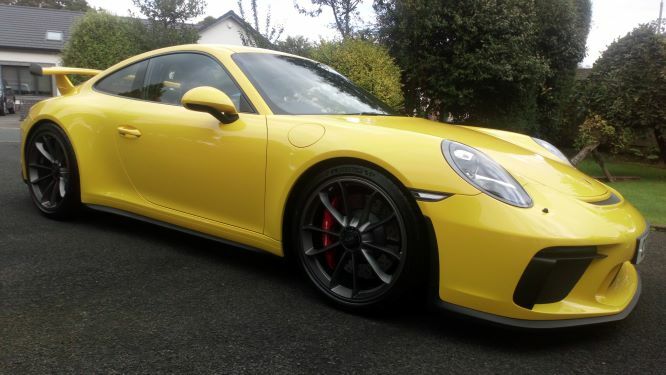 Picked up my racing yellow 991.2 GT3 yesterday evening. Had an absolutely brilliant time at Belfast OPC and was treated fantastically by Carl, Ben and the rest of the team. Stunning hospitality and extraordinary customer service. 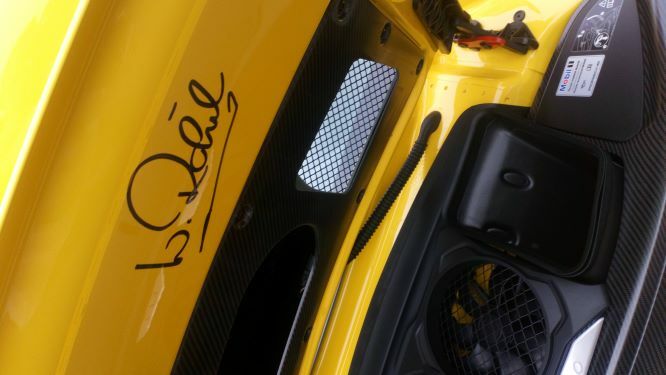 And just when I thought things couldn't get any better, Walter Röhrl comes along to say hello and signs the deck lid. An absolute delight and privilege to talk to Walter. I know I am really blessed to have such a car in my care and I hope that I can do it justice. My 911 learning experience has started all over again with this GT3 and I can't wait for the next lesson. That looks amazing. Congrats and enjoy getting to know the car. Saw a load of GT 3's being driven round Croft the other week and they were awesome. How fortuitous was that to have the main man there when you collected it. Get the signature PPF film covered ASAP!